Our dietary supplement is produced from a collection of fatty alcohols called policosanol. Consisting of several long carbon chain alcohols, policosanol is found naturally in beeswax and various plant waxes. It was discovered by Cuban scientists who were the first to extract policosanol from sugar cane. Since their work in the 1990s, policosanol has been the subject of numerous scientific studies due to its effect on cholesterol synthesis, an effect which has led to its development as a dietary supplement for therapeutic purposes. bad cholesterol, attached to low-density lipoproteins (LDL), transports cholesterol to the blood. We talk about ‘bad’ cholesterol because when it accumulates in the blood, it becomes a danger to health. Scientists are thus focusing on finding ways of reducing bad, LDL-cholesterol levels in order to prevent the development of health complications. In this context, policosanol has been identified by several scientific studies as a natural remedy against cholesterol. A diagnosis of hypercholesterolaemia is made when blood cholesterol levels become abnormally high. This condition leads to the formation of cholesterol plaques in the blood which, as they build up on artery walls, provoke changes to the arteries, causing them to harden. This is called atherosclerosis, the development of which can result in obstruction – and even rupture – of the arteries. Without adequate treatment, this process can initiate cardiovascular events such as myocardial infarction (heart attack) or stroke. Preventing the development of cardiovascular problems by combatting hypercholesterolaemia has thus become a public health priority. This has led to the development of certain anti-cholesterol treatments such as statins. Nevertheless, several research teams are now looking at natural alternatives that are free from side-effects and contraindications. With its positive effect on cholesterol, policosanol could soon be seen as a new and natural option for reducing cholesterol. Available in dietary supplement form, policosanol is currently used to lower total cholesterol levels. It works primarily by inhibiting cholesterol production in the liver. Studies suggest it may also increase the breakdown of bad cholesterol. It may therefore offer significant advantages for preventing or treating hypercholesterolaemia. 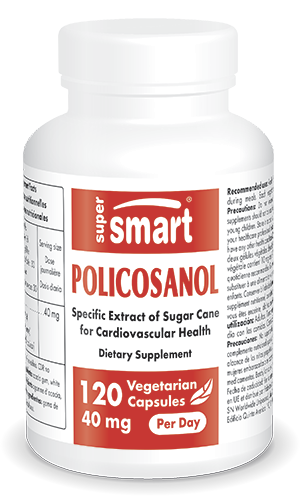 You can benefit from its effects by taking policosanol supplements in the form of vegetarian capsules, optimally formulated to contain 10mg of policosanol per capsule. For maximum efficacy, a dose of one to two capsules a day is recommended though this dose can be adapted according to your needs and the advice of your therapist. You may also find our article on the top 10 helpful anti-cholesterol foods. Other ingredients: ilicon dioxide, magnesium stearate, maltodextrin. Each capsule contains 10 mg policosanol, a specific, standardized extract of sugar cane.